The Las Vegas Strip (Las Vegas, NV, USA) is quite possibly the most alarming place I have visited in my entire life. Thanks to a lifetime of choosing public transport over driving whenever possible, I have been to a good number of rather scary places (thank you very much, public transport). Public transport hubs are rarely situated in the most upscale of locales. However, those less-than-salubrious locations have become scary by accident, over the course of many years and via a series of complicated socio-demographic changes. The Strip, on the other hand, seems to have been created specifically to facilitate the worst aspects of human behaviour, as vast crowds sluice up and down its four-mile length, seeking the next opportunity for gambling, binge-drinking or voyeurism. Dead-eyed punters sit at casino slot machines, hands mechanically inserting dollar bills one after the other. The Strip’s 24-hour casinos give off a heady reek of sweat, adrenalin and stale cigarette smoke under the endless day of artificial lights, while the industry behind the casino hotels seeks to part visitors from their dollars in the most grimly efficient manner conceivable. But The Beauty of Transport isn’t here to judge the moral standards of visitors to the Strip, and anyway, as you’ll have gathered by now, I’ve been a visitor there myself. The Beauty of Transport is here, however, to highlight one of the most heinous crimes recently committed against transport architecture, which can be found on the Strip. But to put that particular brain-frazzler into context, I need to take you back to early nineteenth century Britain, and two pioneers of disreputable transport architecture. They are actually transport heroes for countless other reasons, and I demur to no-one in my admiration for them (they are in large part responsible for the industry I worked in for years, and still write about). Though Thomas Telford’s and Robert Stephenson’s bridges at Conwy in Wales are very beautiful, the truth is that they also demonstrate terrible artifice. Thomas Telford (1757-1834) is one of the giants of transport history, a Scottish civil engineer who transformed Britain during the first decades of the Industrial Revolution. He worked tirelessly to open up the country by building national transport links including the Ellesmere Canal, the London-Holyhead road, and in the case of this week’s entry, the North Wales Coast Road. At the Welsh town of Conwy, Telford hit a problem, in the shape of the River Conwy. There was no going round it, so a bridge was the only solution. Further giving Telford a headache was the presence of the thirteenth century Conwy Castle, on the west side of the river, just at the most convenient crossing spot. This was no coincidence. The castle was built by English king Edward I to guard a walled town he had built, as well as one of the few spots on the river where an enemy army (in this case, the Welsh) might try to get across. Until Telford arrived, the Conwy crossing was undertaken with a river ferry – slow, uncomfortable, and sometimes downright dangerous. It certainly wasn’t going to do for road traffic making its way towards Holyhead, the port for the shipping service to Ireland. Telford designed a very attractive wrought iron suspension bridge to cross the River Conwy. 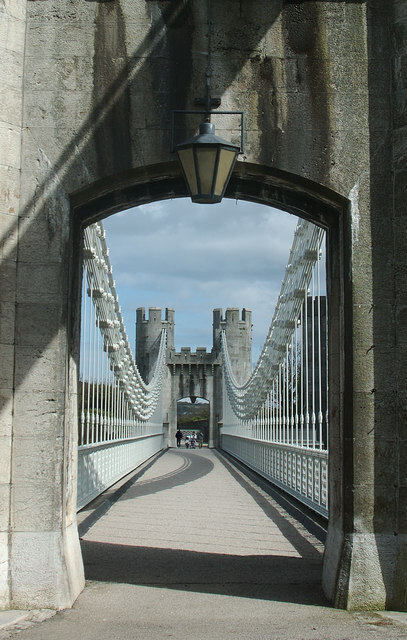 Along with his nearby (and larger) Menai Suspension Bridge, his Conwy Suspension Bridge was amongst the very earliest road suspension bridges in the entire world, not to mention one of the pioneering wrought iron suspension bridges in general. It opened in 1826, only 45 years after the construction of the very first bridge to be made of iron in the entire world. Suspension bridges, which hang a traffic deck from suspension chains or cables strung between towers at each end of the bridge, allow for very wide spans. This was useful in the crossing of the wide and fast-flowing River Conwy. However, the suspension chains/cables on a suspension bridge need to be anchored into solid ground at either end of the bridge. It was here that Telford hit a design difficulty. The location needed for the western anchor points of the chains was exactly where a bit of Conwy Castle stood. Fortunately, this was Industrial Revolution Britain, so it wasn’t really much of a problem for Telford at all. The offending piece of castle was simply demolished to make way for the anchor points. It seems incredible to think of it now, given our current respect for the historic built environment when constructing new transport schemes. 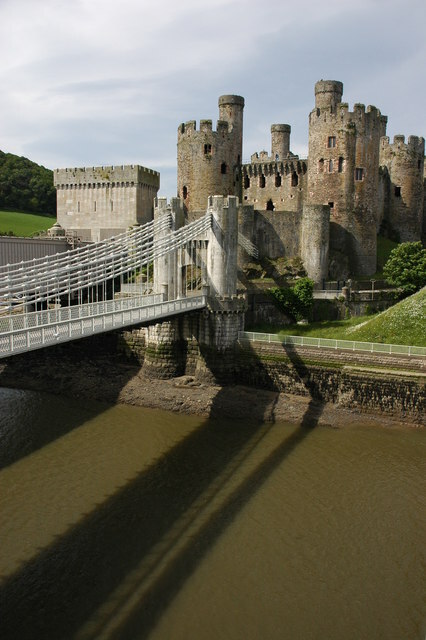 As if to make up for the offence caused to the castle, Telford designed the towers at each end of his suspension bridge in a faux-Conwy Castle fashion, making them look a bit like Ye Olde Castle Drawbridges. Each tower is faced with stone and features two round turrets flanking a wall, topped with a parapet walkway, and pierced by a segmented arch to allow traffic through. Twee castellations top the structures and all parts are decorated with arrow loops (which are fake, being filled in further behind the facade). This goes quite against current thinking when it comes to building in the immediate vicinity of historic buildings or adding extensions to them. Nowadays, the general thinking is that buildings’ histories should be legible, and later additions should not pretend to be parts of the earlier building. They need to complement the older building, but not be disguised as parts of it. This does make sense when you think about it, and new additions to historic buildings (such as the northern extension to the trainshed at St Pancras International station in London) can be modern yet still complement the older building. Telford’s design, on the other hand, is a bit of a fake. His bridge (whilst otherwise quite beautiful) never needed defending by archers against an oncoming army. Its towers never needed arrow loops and castellations, and their presence is really quite ridiculous. It’s all for show. Telford’s Conwy Suspension Bridge was a great success, whatever later observers might make of its architecture and the willful damage to a historic monument to enable its construction. It remained in use by road traffic until 1958, when it was replaced by a new bridge, and is still open as a pedestrian footbridge. It is a historic monument itself now, cared for by landscape and heritage charity the National Trust (as you can see here). It is Grade I listed by Cadw, the Welsh heritage organisation, the highest level of official protection which can be afforded to a building. After Telford’s suspension bridge, all went quiet in Conwy until the next phase of the Industrial Revolution, the development of Britain’s national railway network. Tasked with building a railway along the north Wales coast to Holyhead, engineer and general all-round railway genius Robert Stephenson (1803-1859) found himself in Conwy, contemplating the same problem Telford had faced two decades earlier. Again, he needed wide spans to cross the river, but the suspension bridge technology of the time wasn’t going to cut it for a new railway. Trains are not only very heavy, but they move at speed, subjecting a bridge to considerable forces as they cross. Stephenson needed a new solution, and with his colleague William Fairbairn came up with one in the shape of the tubular bridge. 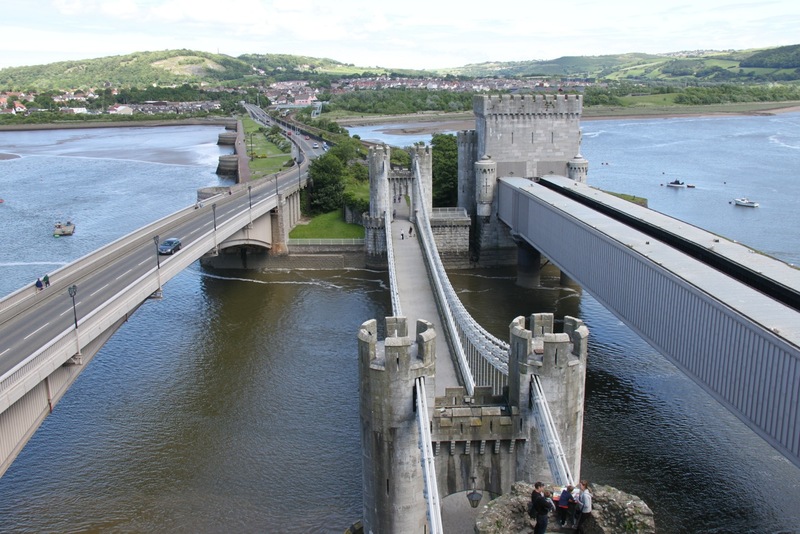 Conwy railway bridge was the very first of its type in the whole world, and it was opened in 1849. The tubes, through which trains run, were stiffened by a cellular construction above and below the main wrought iron tube, and this gave the bridge sufficient strength to take the forces imposed by moving trains, while still being rigid enough to span the wide river. At each end, the tubes are supported by two towers. 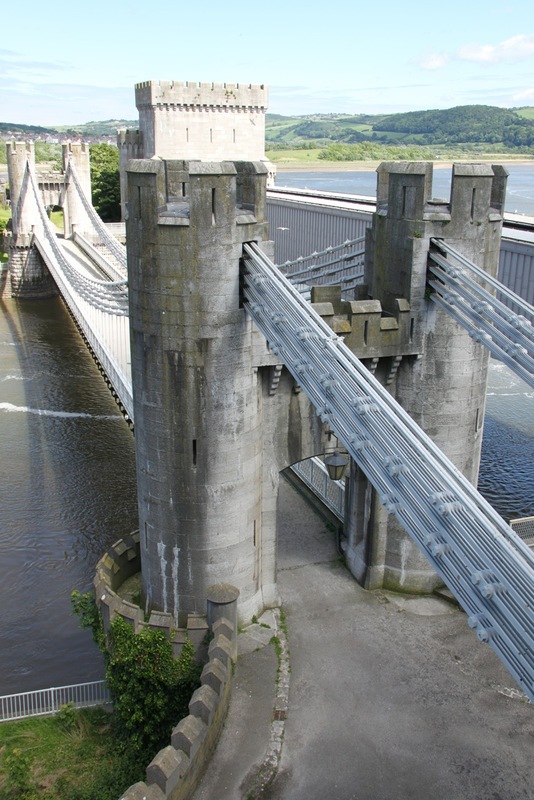 Once again, just like on Telford’s earlier suspension bridge, those towers are designed in a faux mediaeval style, with round turrets flanking a rectangular central section, decorated with castellations and blind arrow loops. Two slightly underscale round arches allow the railway tracks through the towers and into the iron tubes. The uneasy arrangement of these arches demonstrates the problem of trying to adapt a design meant for a castle into use as a piece of transport infrastructure. The bridge is magnificent in concept, but the design of the towers is an architectural sham. Let’s face it, even if you wanted to shoot an arrow out of one of the (fake) arrow loops, the enclosed nature of the tubes mean there’s nothing to shoot at even when a train is crossing. The round turrets have corbelled tops, which is intriguing given that the castellated turrets on the castle, with which the bridge is supposed to be blending in, do not; they are sheer-sided all the way to the top. Like Telford’s, Stephenson’s bridge was a great success, and it remains in service to this day, strengthened decades after its completion by some additional supports under each end, but otherwise in full working order. Also like Telford’s earlier bridge, Stephenson’s tubular bridge is Grade I listed by Cadw. Stephenson repeated the design at a larger scale on the Menai Strait between the Welsh mainland and the Isle of Angelsey, though that bridge was rebuilt without its iron tubes after it was damaged by fire in the 1970s. The tubular bridge seems a strange concept today, with trains crossing a bridge enclosed in an iron tunnel. It wasn’t a bridge type that lasted very long. As technology improved, and steel became the building material of choice, there was no longer any need for tubes to provide the necessary rigidity on bridge decks. More open designs could do the same job, and more cheaply. It wasn’t long either before the aesthetics of railway engineering would move on too. 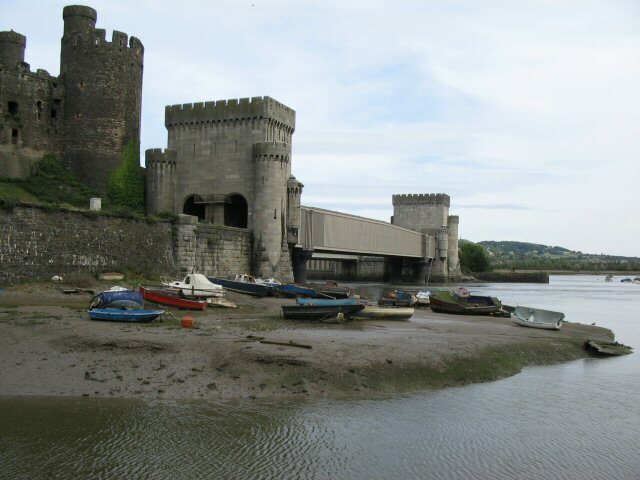 The two Conwy bridges are faux-mediaeval. Telford’s and Stephenson’s larger bridges over the Menai Strait went for a sort of vaguely classical architecture. By the end of the nineteenth century, railway engineers were confident enough to build steel bridges that were beautiful simply because of what they were, without the need to add old-fashioned-style decorative bits that referenced eras nothing to do with the bridges or their purpose. 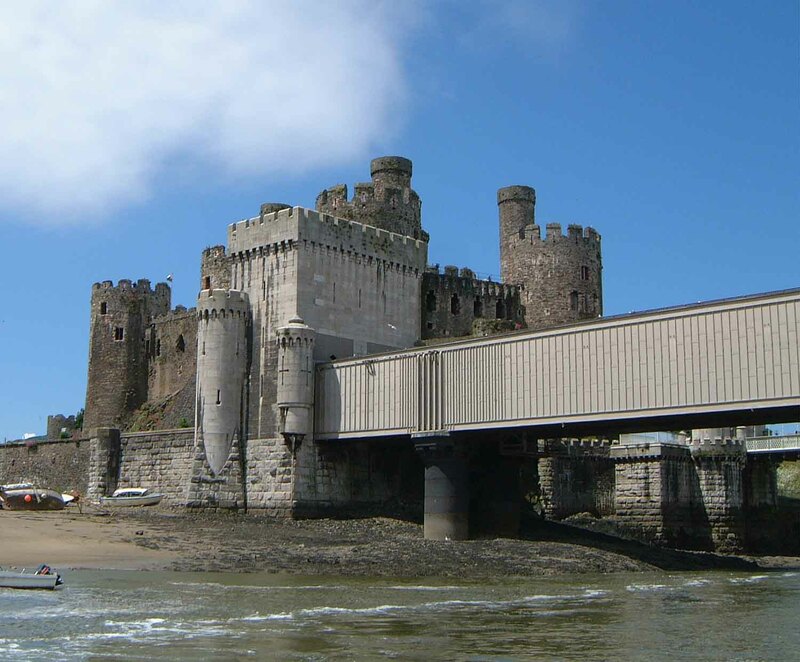 Today it’s virtually inconceivable that a new transport bridge would be permitted to knock down part of a mediaeval castle for its construction, and I can’t believe a railway would be allowed to be built hugging the outer wall of a castle, as the railway line in Conwy was. Indeed, many statements from the UK Government about Britain’s proposed High Speed 2 line from London to the north of the country are about how it has found new and expensive ways to hide the line from seemingly anyone’s view. As far as Telford and Stephenson were concerned, in designing pretend mediaeval bits on their bridges they were respecting the nearby castle (apart from the bit that needed demolishing, of course…). Their intent was good, even if it might be considered poor practice today. Anyway, it’s a problem still facing transport architects. At St Pancras International, the extension of the train shed is in a modern style, clearly marking it out as a later addition to the building. A recent extension to Gilbert Scott’s Victorian Gothic hotel, along the west side of the station, has been designed to blend in with (or counterfeit, as some would say) the older building, and this part is much more difficult for the casual observer to read. Very interesting, thoughtful, and informative, as usual. My brother worked as a teacher in Las Vegas for many years; it was quite surreal visiting him, “downtown” is all the brash ugliness you alluded to, away from that Las Vegas turns into small town America (well, almost! ), with normal suburbs, teachers, garbagemen, doctors, local shopping malls, pizza delivery guys, etc etc. Indeed. I was very careful (and I hope that came across) to be specific that I was referring only to the Strip. I didn’t have chance to explore the rest of Las Vegas so I wouldn’t want to tar it with the same brush. The people I met from the other bits of Las Vegas were, as with the enormous majority of Americans I’ve met, absolutely lovely. So I can well believe that the rest of Las Vegas is perfectly normal. Thank goodness!